Behind the French Menu: Hareng - Herring. The Humble Herring in French Cuisine. Hareng - Herring. 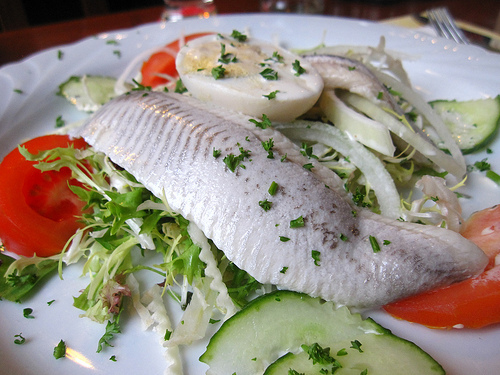 The Humble Herring in French Cuisine. Photograph courtesy of RA Torsten Kellotat. Hareng – Herring; the fish. Herrings are a seriously tasty fish, full of omega 3, but they are also a fatty fish. With that said they are a favorite appetizer in France and they have the fatty taste removed by grilling, marinating, pickling, salting, smoking and poaching. The two herrings that will be on French menus are the Baltic Herring and the Atlantic Herring. They fight for your Euro and their place on French menus. 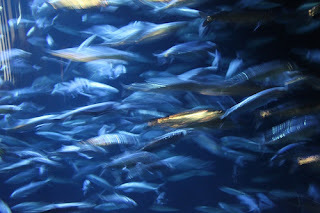 In French fish markets, you will see that the herring caught in the Baltic Sea are smaller than those found in the Atlantic Ocean and according to the herring mavens are tastier. Fish, after all, are flavored by what they eat. Nevertheless, the Baltic and the Atlantic herrings are, in fact, the same species with the different seas making the serious differences. The Baltic herring tops the French popularity stakes. When the Baltic herring is served its provenance will be noted. Hareng Baltique au Vin Blanc - Herring from the Baltic Sea marinated in white wine accompanied by sliced, lightly marinated onions. The marinades for this herring dish are simply made. The recipes may vary slightly, but all begin with fresh fileted Baltic herring, white wine, wine vinegar, bay leaves, pepper, coriander, parsley and sliced onions. After the herrings and onions have been left in the marinade, in a refrigerator, for 8 - 10 hours they will be ready to serve. Hareng Bismarck – Bismarck Herrings. Bismarck herring filets are lightly marinated in vinegar, sugar, salt and onions, and herbs. This method of preparation predates the German Chancellor, Otto von Bismarck by many hundreds of years. However, since they were part of Bismarck's renowned substantial breakfast, this herring recipe was renamed in his honor. 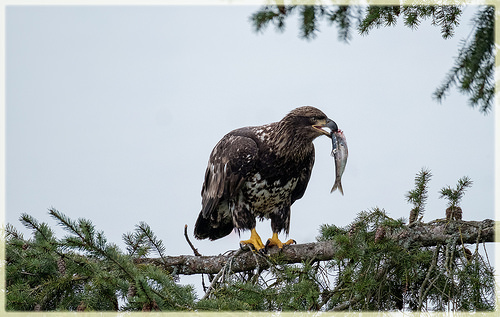 Young bald eagles also like fresh herring. Bismarck was the Chancellor of the German Empire and is not well remembered by the French. It was Bismarck’s political maneuverings that drew Napoleon III into a war that France could never win; that was the disastrous Franco-Prussian war (July 1870 – January 1871). That war had Napoleon III riding into battle on his horse like a storybook king leading an army with weapons from 50 to 100 years before. Bismarck had new cannon, and few of his soldiers rode horses to war, they came to the battlefield with their horses by train. The war resulted in the capture of Napoleon III and the occupation of Paris. That was closely followed by the Paris Commune, Napoleon III's abdication, and his exile to England. Napoleon III was also responsible for the invention of margarine and so probably many French would have said he deserved exile. Napoleon III’s son was the Prince Imperial and would have been Napoleon IV, but he died fighting the Zulu in Africa with the British army. Napoleon III and Napoleon IV’s remains were not brought back to France like those of Napoleon 1 who had been buried on the Island of Saint Helena where he had been buried. Napoleon III and Napoleon IV’ are buried with the Empress Consort Eugénie in the Benedictine Abbey of Saint Michael's, Farnborough, Hampshire, England. The crypt, behind the high altar, was donated by Queen Victoria. BTW one of Napoleon I's great-great grand-nephews, Charles Bonaparte, founded the FBI in the USA. (No, the FBI was not founded by J. Edgar Hoover). Napoleon I is buried under the Dôme des Invalides, the Hôtel National des Invalides, Paris. Harengs à la Russe – Herrings marinated in the Russian Style. Herrings marinated in a white wine vinegar, flavored with black peppercorns, garlic, coriander and sliced onion, malassol cornichons and canola oil. Hareng Bouffi or Hareng Craquelot - A bloater. Bloaters are large, fatty, whole, herrings, brine-soaked and then cold-smoked whole for less than twenty-four hours. A hareng bouffi may sometimes be confused in a French menu’s English translation, with the British kipper. That happens despite their different recipes and their looks being decidedly different. A bloater is the whole fish, salted and smoked with its innards intact. 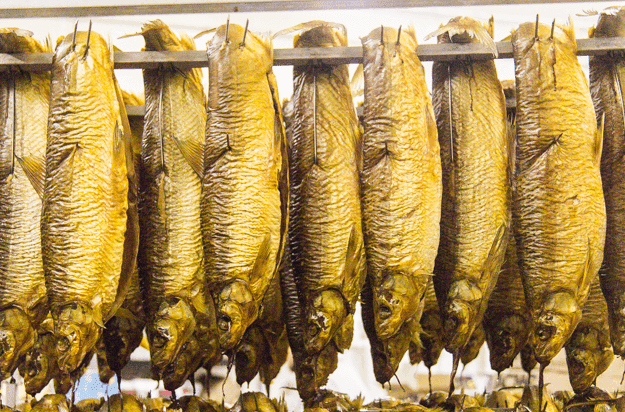 A kipper is split open and cleaned, slightly salted, and then cold smoked for about three days. In the USA there may be some confusion with the name bloater, a small North American freshwater fish. This is a little fish, up to 20cms in length, mostly found in the great lakes; it is called a bloater, but it is not related to the herring family. Hareng Fumé - Smoked herring. Smoked herring, served warm or cold is very popular in France and the name covers a broad range of recipes. In most restaurants these herrings will be hot-smoked by the chef and hot smoking cooks the fish. 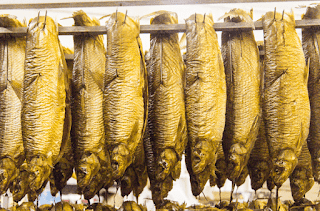 Cold-smoked herrings and other cold-smoked products require a smoke-house and they are used for many foodstuffs that may be stored afterward without freezing; that includes France's popular Andouille and Andouillette sausages, smoked salmon and kippered herrings. Cold-smoking requires a great deal more determination and equipment than that used for hot smoking. There are chefs who like the control and creativity along with the varied tastes that a smokehouse provides. Apart from those chefs who enjoy cold-smoking, most restaurants have their cold-smoked products brought in. Tartare de Hareng Fume – Smoked herring tartar will be on many menus. Chopped smoked herring will be mixed with firm, fresh uncooked fruits and vegetables including apples, cucumbers, onions, beetroot and or radishes. The flavor will vary; some tatars being mixed with crème fraiche and herbs and others with Tabasco or horseradish. When Tartare de Hareng Fume is on the menu ask for more information. The original Tartars, the Golden Hordes, were said to ride to battle living off raw meat that was stored under their saddles and that misinformed story gave birth to the story behind Steak Tatar. However, I doubt the Tatars ever rode with smoked herring under their saddles. Filets de Harengs Fumés et ses Pommes Chaudes à l'Huile – Smoked herrings served with hot sliced potatoes prepared in an and oil and white wine or vinaigrette dressing. Hareng Kippers – Kippers or kippered Herrings. Kippers are the famous and traditional cold-smoked herrings from Scotland, and I have only once seen kippers on a French breakfast menu. Do not expect these smoked fish to have swam down the Atlantic or across the Channel to French restaurants. If you do want kippers its best to enjoy them in England or to take the train or plane and ship to the Isle of Mann , Scotland or Ireland. Kippered herrings will have been split open, lightly salted and then cold-smoked. The name kipper is assumed to have derive from the copper coloring of a well-smoked kipper; however, copper coloring agents are now banned, and kippers come in shades from yellow to light red and brown. 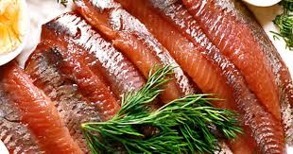 The Norman-French changed the language used in English kitchen's when they invaded and conquered England in 1066, but there are no clear French connections to the original Scottish kippers. Nevertheless, there is the remote possibility that Mary Queen of Scots brought back some ideas when she left France for Scotland as a widow in1561. Hareng Matjes – Matjes Herrings. Matjes Herrings are skinned and fileted before being cured in a salt-sugar-wine vinegar marinade. The original Matjes herrings were a Dutch creation, which explains the name; they are made with fat young herrings that had not yet spawned. Depending on the marinade the final color of the herring may be white or red to brown. In a good fish restaurant, ask a few questions, and you may be in for a treat if the chef marinated his or her own Matjes herrings. Photograph courtesy of Olearys S.B.D. Dutch herring masters know their fish, and they do not take second place to anyone. 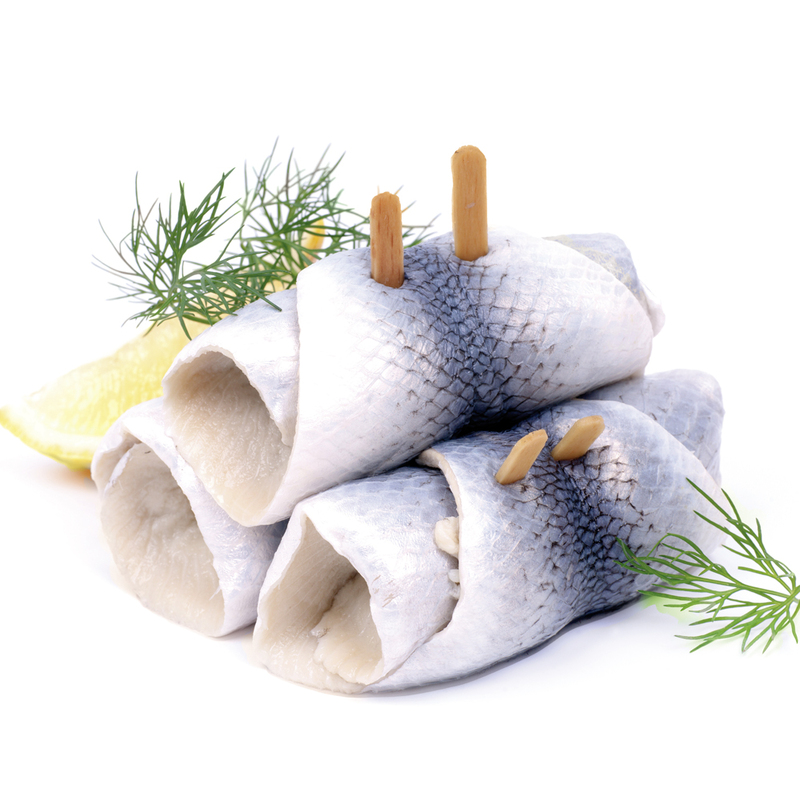 When given the opportunity try fresh Matjes Herring on its home ground. Over the years, the recipe has changed, and now even Dutch Matjes Herrings have wine in the marinade. Hareng Pec - A unique French salted herring; it is a relatively dry, but, freshly salted young herring. These herrings have been popular in France since at least the 15th century. Then the French poet Chapelle, (Claude-Emmanuel Luillier 1626-1686) wrote a poem in their honor. Today, sometime, Saur herrings may be on the menu as Pec; they are similar but far from being the same. A pec herring is not smoked. Hareng Saur - Saur herring; often incorrectly called Sour Herrings. Saur herrings are salt cured for two or three weeks and then desalted. At the end of the desalting process, the herring is then cold-smoked for three days. This recipe has changed little in the last 500 years. Nevertheless, along the way, the origin of this herring's name was lost. The name saur probably comes from the German in the same manner that sauerkraut is used for pickled cabbage; saur means pickled in German. Hareng Schmaltz - Schmaltz herrings. Salt cured and then rinsed to remove most of the salt before being served. This herring was a staple food, that could be stored over the winter in Eastern Europe. The word schmaltz means fat in old German and in Yiddish. The herrings used are full-grown herrings that are fatter than younger herrings. In France’s best Charcuterie –Traiteurs, her incredible delis, you will find genuine schmaltz herring. Rollmops, Hareng Rollmops - Rollmops are large filets of herring; usually, large Bismarck herring filets wrapped around a pickle and kept rolled with a toothpick or wooden skewer. Œufs de Hareng – Herring Roe. Herring roe is a delicacy in France and prepared with many different recipes including marinating and smoking. Herring roe is on many menus as herring caviar despite the word caviar being legally reserved for the roe of the sturgeon. Pommes de Terre Nouvelles au Caviar de Hareng – Herring roe with new potatoes. Saumon Gravlax, Mimosa d’Œuf, Caviar de Hareng Fumé – Atlantic salmon cured in the Scandinavian manner accompanied by egg mimosa, and smoked herring rose. (Mimosa are hard boiled eggs with the yokes removed chopped and returned with a mixture of mayonnaise, paprika and more). Harenguet – A sprat, a small member of the herring family, at most about 12cm (5”) long; usually canned and sold as sardines or brisling sardines. In the UK these and other small fish up to 5cm (2') long may be lightly fried and served with the name whitebait. The other herrings on French menus. Most herrings are small fish weighing under than 500 grams (18 ounces), and they may be baked or fried apart from being marinated or smoked. 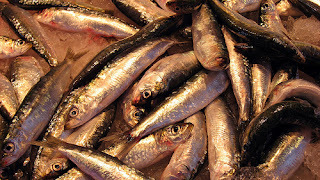 The smallest herrings, under 80 grams (3 ounces) will be sold as sardines. In North America there are the Atlantic and the Pacific herring and in Central and South America a number of other family members. Just as trout and salmon have a relationship. Other fish like shad, for example, have connections to the herring. Alose or Grande Alose; Shad or Allis Shad on French Menus. Andouillettes. The Sausages of France I.
Charcuterie-Traiteurs in France. The Ultimate Delicatessen? Cornichons – Crisp, Crunchy, Vinegary, Slightly Salty, Miniature Cucumbers (Gherkins). Cornichons in French Cuisine. Coriandre - Coriander, the Herb. Coriander and Cilantro are Different Names for the Same Herb. Crème Fraîche - Creme Fraiche. What is Crème Fraîche? Crème Fraîche on French Menus. Emperor Napoléon Bonaparte and the FBI. Fresh Sardines, a tasty and special treat on French Menus. Persil - Parsley. Parsley in French Cuisine. Poivre - Peppercorns. Peppercorns in French cuisine and on French Menus. Sardines. Fresh Sardines. If you Have Not Tasted Freshly Grilled Sardines, you Have Not Really Tasted Sardines. Tabasco Sauce, its Origins, and its Place in French Cuisine. Tartare,Tatar, on French Menus: Steak Tartar, Fish Tartar and Vegetable Tartar. Tartare on Your French Menu? When a French Menu is Not an English Menu!